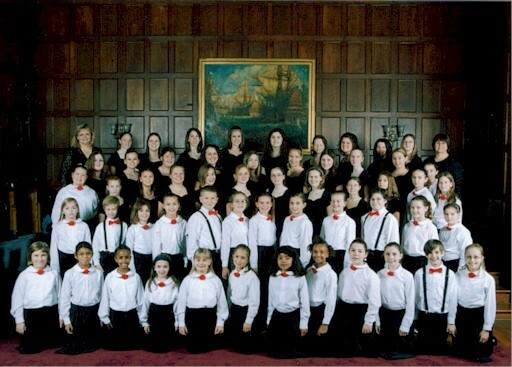 The Litchfield County Children’s Choir was founded in 1990 by Christopher E. Shepard and Barbara E. Soderberg. The legacy continued under the direction of Amy F. Bernon from 1996-2002, and continues now with Anna Jedd and Lynne Kearney. Since its inception, LCCC has provided musical training and superb choral experiences for hundreds of singers in local communities. Currently, there are two choirs. The Junior Choir serves singers in the 3rd through 6th grade, providing instruction in basic vocal production, music literacy and performance skills. The Senior Choir is comprised of singers in 6th through 12th grades, providing singers with advanced vocal skills, challenging repertoire and multiple performance opportunities throughout the state of Connecticut. LCCC offers students a variety of fun and challenging musical experiences including the opportunity to premier new compositions. Rehearsals and two annual concerts are held at The Taft School in Watertown. The singers have also appeared with the Connecticut Choral Society, the New Haven Symphony, the Waterbury Symphony, the Naugatuck Valley Community College Choir, the Waterbury Chorale and the Connecticut Master Chorale. In addition, LCCC choirs have sung in numerous children’s choir festivals and for community events. LCCC is thrilled to be performing with the Connecticut Master Chorale.